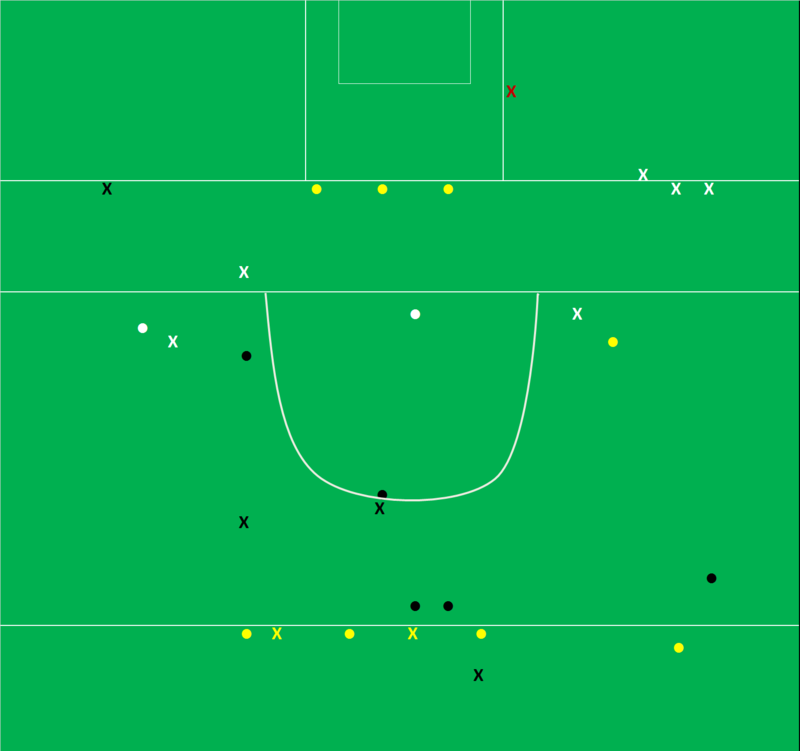 In the Cork-Mayo game we saw, in a very generalised nutshell, Mayo’s volume of shots outlast Cork’s quality of shots. 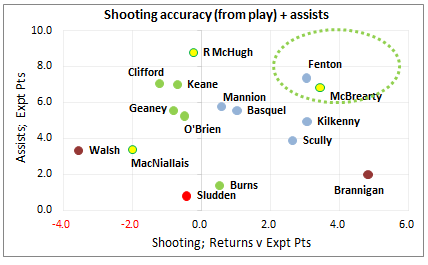 In this game it was a case of plain old accuracy – Kerry had it in abundance (especially from play) whilst Galway did not. To be honest I expected the Galway returns to be a lot worse. If we exclude the last three minutes where Galway took desperate pot shots at goal they would have returned a 44.4% Success Rate with a weighting of -0.111. 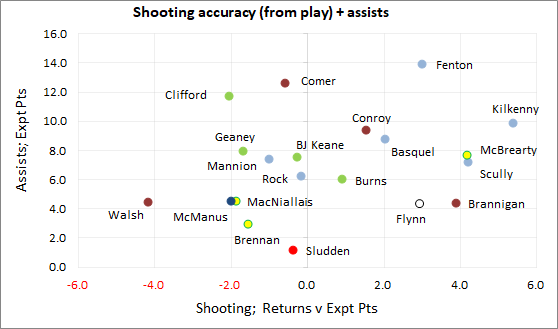 An essentially average shooting display despite their atrocious first half (27% Success Rate and a weighting of -2.174). Kerry will again be very pleased with their Shot Rate. The 88% achieved here follows on from the 90% in the Munster final. Both teams had virtually the same volume of attacking possessions however looking forward to the semi final it is interesting to note where those attacks emanated from. The volumes in the main categories (kickouts & turnovers) are virtually the same but where the turnovers occurred is important. In total Kerry were turned over ten times outside Galway’s 65 with nine of them converted to attacks. Now due to Galway’s poor shooting they did not hammer home this advantage – scoring a measly 0-01 from this prime attacking ball – but we know that Mayo will. They scored 1-05 from the turnovers they generated outside of their own 65 against Cork. 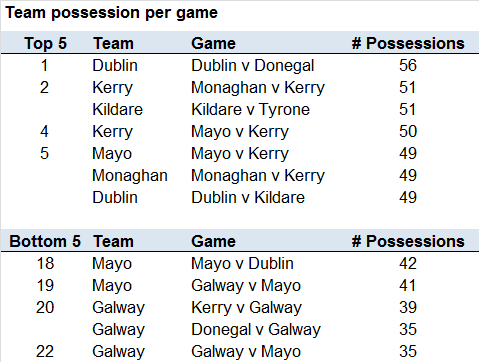 Kerry cannot be as lax with possession against Mayo as they were here. Kerry’s shooting boots were most definitely on and none more so than O’Donoghue’s. He was five from five when going for points and his only miss of the day was a goal shot that skimmed the outside of the upright. O’Donoghue is on fire at the moment. Between this game and the Munster final he is running at a remarkable 82% Success Rate when shooting from play (14 from 17 with a weighting of +5.379). Two of his three misses have been when he went for goal so when having a shot for a point he is an absurd 93% on 14 shots. But it is not just O’Donoghue – excluding his shots from play Kerry have a 55% Success Rate (24 from 44) which is well above the average. Against Cork it was P Geaney & J Buckley that had their radar in – here it was Barry John Keane (3 from 4). The one caveat to all this superb shooting is the defences that Kerry have faced. In the two aforementioned games only 38% of their 61 shots from play have been taken under pressure. Will they get that time and space from Mayo? And if they don’t can they convert at the same rate? 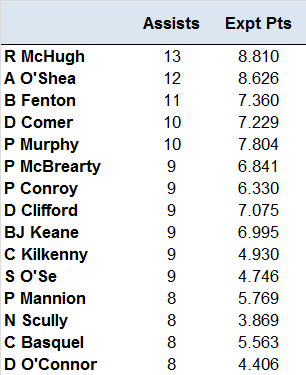 In the Cork game it was highlighted that despite some spectacular individual attempts from Sheehan the returns for the team were average – both in that game and in 12 previous games where Cooper was not the free taker. Here the returns are particularly bad. That is due to the fact that the two they converted were very central – thus the weighting achieved for converting them is quite small – whilst P Geaney missed one from the top of the D. O’Donoghue missed one from a similar range against Cork. 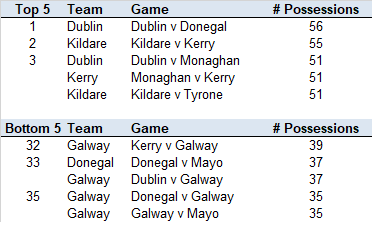 We are talking about very small sample sizes here (5 in this game, 7 in the Cork game) so with (possibly) only two games to go it might never be an issue but in a very tight game Kerry’s free taking inconsistencies may act as an anchor. As an aside I did like Walsh’s symmetry taking two frees with his right & two with his left! His only miss was far out on the left from where the returns are generally c40%. A tale of two halves for Kerry. 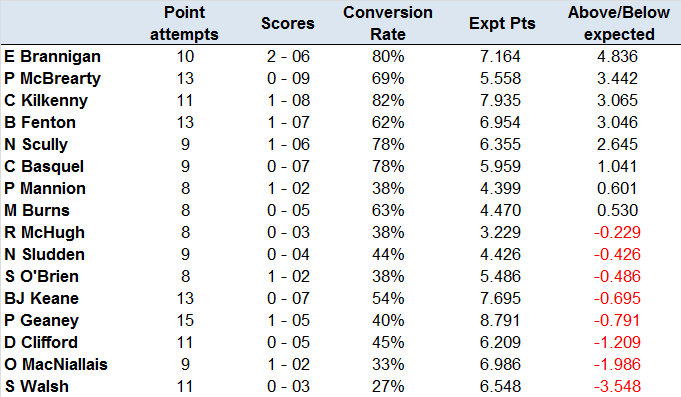 In the first they were very clinical; of the twelve turnovers they received they converted 75% to shots and scored 1-05. Indeed their early lead was essentially built on turnover ball scoring 1-03 from the first five turnovers they got their hands on. In the second half this economy evaporated. Kerry manufactured 14 turnovers but only 50% were converted to shots with a return of 0-03. 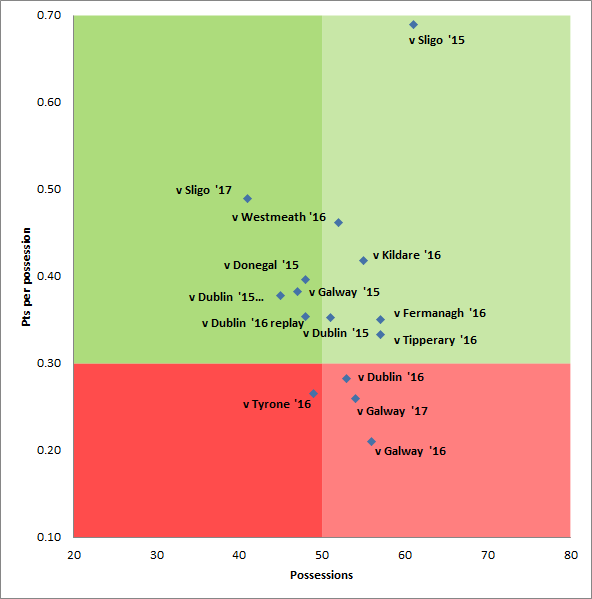 Galway were every bit as effective at converting the turnovers they received to shots but as we have seen previously this was hugely aided by where they received the turnover. A further point to note is that 24% (6 from 25) of all Kerry’s turnovers were from shots that didn’t go dead. This is quite a random act with huge variance in volume from game to game. In the 2nd half Kerry went 25 minutes without a pass going astray – they did something similar against Cork when there was a 31 minute stretch where they did not misplace a ball. When Kerry are switched on and locked in they have a huge capacity to control the tempo of a game by the sheer accuracy of their passing. A prime example of this accuracy was the move that led to O’Donoghue’s missed shot. 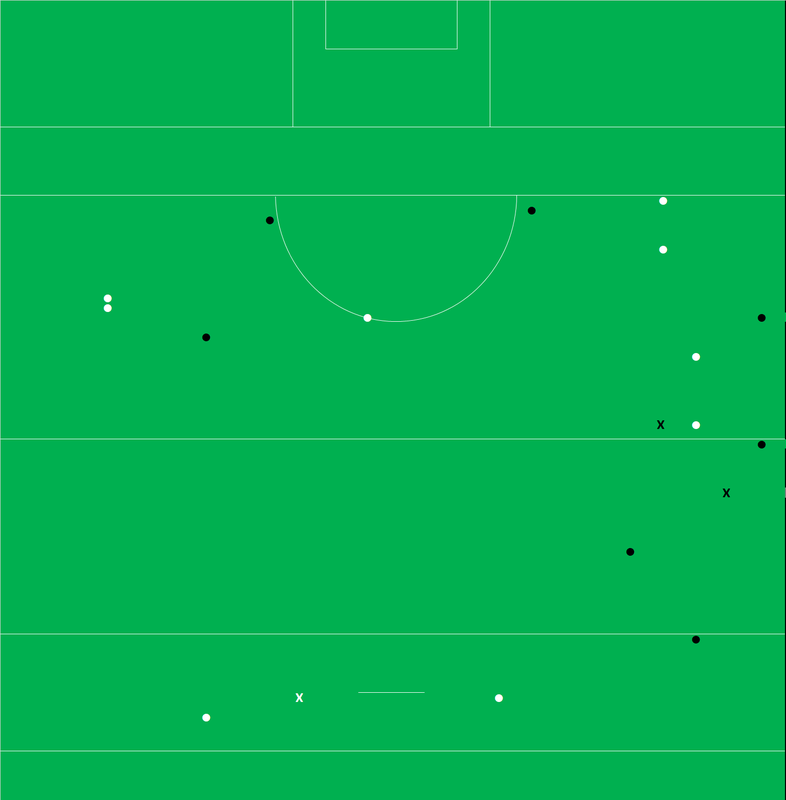 Kerry received the ball at the top of their own D and proceeded to get the ball to O’Donoghue with four kick passes where the player never hopped or soloed the ball. Counter attacking football in its purest form. Essentially parity in who “won” the kickouts with both teams moving the possession gained into the opposition’s 45 at a similar rate. Kerry only went short four times thus winning the more contestable kickouts, past the 45, 15-8. 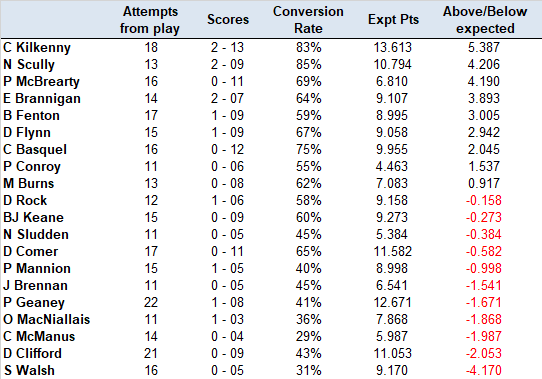 Of those 23 kickouts I had only two being received by a Kerry player under no pressure. It will be interesting to see if Kerry are as willing to take on the Mayo middle third set up as they were the Galway one. When Galway went past the 45 with their kickouts against Mayo they lost the battle 13-9. 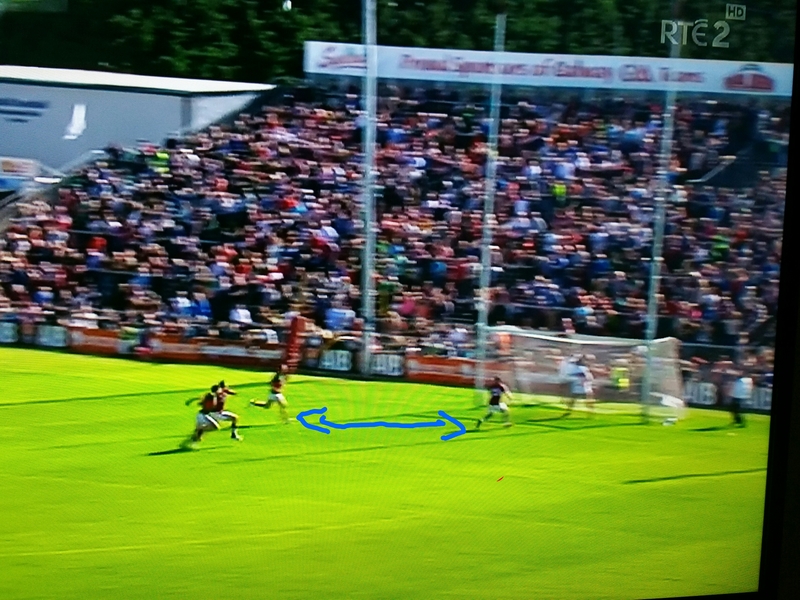 Galway went short five times thus they won their own contestable kickouts 12-10 (the cameras missed where one landed so it cannot be determined where the ball landed). Again there was little in the way of “directional” kickouts in that 19 of the 22 kickouts past the 45 were won under some form of pressure. In both the Tipperary & Mayo games it was highlighted how unusual Galway were in that a high percentage of their shots came from the left. It was curious therefore to see that they didn’t take one shot from the left when their dander was up in the second half.